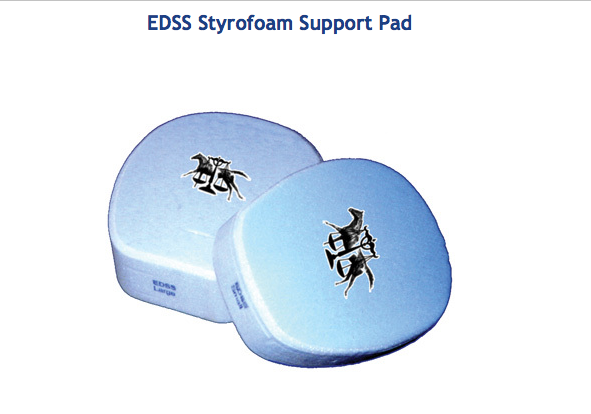 Styrofoam Pads - First Aid for Laminitis! I was reminded today when looking online for some dental impression material for hoof packing that these styrofoam pads - along with a roll of duct tape - belong in every barn! (And on every veterinarian's, farrier's and other hoof professional's truck.) You may never need to use them but the styrofoam pads can be a lifesaver for a horse with acute laminitis while you get the diet and other factors in line. You need at least three sets that fit your horses to start - on heavier horses they will compress quickly so you may need to stack three pads in two to three days or less. If you have small, average and large horses, you should keep three sets in each size on hand. The newer instruction video is easy to follow. If the horse has a lot of extra toe length and you're not adept at trimming you may need your farrier/trimmer to trim and bevel the toe for you. But you can apply the foam while waiting for the trim or before shoes are pulled. Initially, get the hoof as clean as you can but if the horse is really sore that may be difficult - you can spend more time on "super cleaning" with a vinegar rinse in a squirt bottle between the first and second pad application (and some medicated powder can help with "hoof funk"). I can hear now "OMG, $33 for 3 sets times 3 or 4 sizes? I can't afford that!" Believe me - when you see your horse suffering from the pain of laminitis, you'd be willing to pay hundreds to relieve that pain (and the emergency vet bill will be at least that). So a few dollars spent on "insurance" now ("something providing protection against a possible eventuality we hope never happens") will be well worth it if you ever do need it. 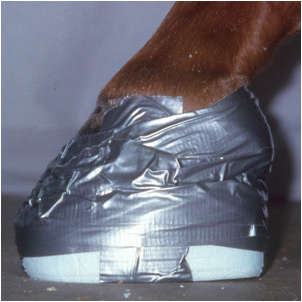 PS - Dental Impression Material can be the long term support solution to help you rehab your horse in boots. Check with your local farrier supply or see the links below.